FISO’s proposition to support the effort of utility companies is the Nortech Transformer Winding Hot Spot Temperature Monitoring System. Using proven Fiber Optic technology the Nortech system allows for direct, real-time, and long-term monitoring of power transformers, providing smarter dynamic substation and power grid management. The TPT-62 family of fiber-optic temperature probes employs industry standard 62.5µm core OM1 optical fiber for vastly improved optical, mechanical, and reliability properties over legacy 200µm core (1st generation) optical fiber sensors. 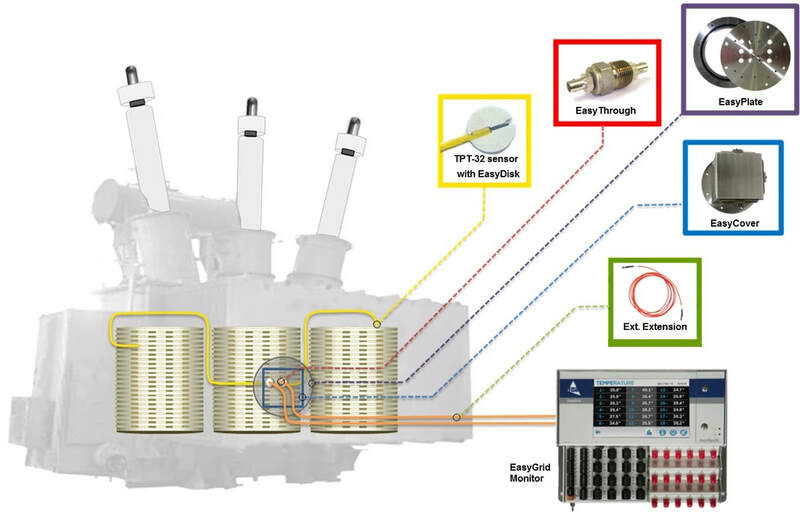 ​The EasyDisk sensor tip assembly ensures IEC60076-2 Annex E compliant installation and enables quick insertion of the probes into the spacers within the windings of the transformer. The Nortech family of temperature monitors are provided in two classes: The EasyGrid is a full featured model, while the EasyGrid LT is a more compact model and very cost-effective in low channel count monitoring applications. The measurement principle is based on white light absorption/transmission by a GaAs (gallium arsenide) semiconductor. The effects of temperature variations on this semiconductor are well known and predictable. As the temperature of the semiconductor changes, the semiconductor’s transmission spectrum (i.e. the light that is not absorbed) shifts also. At any given temperature there will be a wavelength at which the transmission jumps from essentially 0% to 100%. 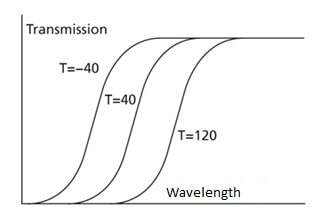 This jump is called the absorption shift, and the relationship between the specific wavelength where the absorption shift takes place and temperature is predictable. The sensor consists of a tiny GaAs semiconductor crystal bonded to one end of a well-polished optical fiber. White light launched from the monitor into the optical fiber travels through to the GaAs crystal, passes through it while being partially absorbed, and then is reflected back to the monitor by a mirror at the very tip of the sensor. Light reflected back to the monitor is coupled into an optical spectrum analyzer which then measures the optical power transmission versus wavelength. The position of the absorption shift is determined by the monitor using a proprietary signal analysis algorithm and is then correlated to the temperature of the GaAs crystal. Furthermore, since the semiconductor will not change over time, all sensors are interchangeable with no need for calibration or entry of factors when swapping sensors. For the same reason monitors never need recalibration after they leave the factory, while used under normal operating conditions.